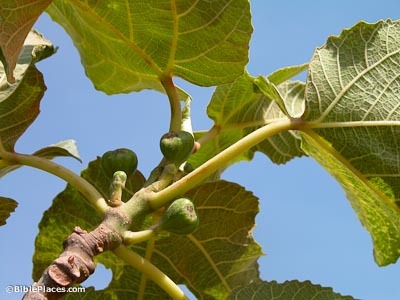 Growing to nearly 20 feet (6 m) in height and with large leaves, the fig tree provides pleasant shade. 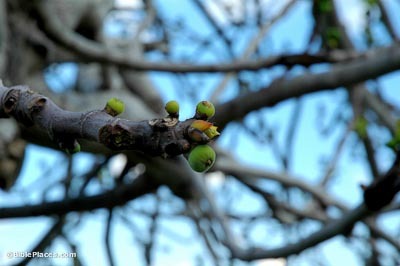 Minute wasps cultivate these trees, and the fig is produced before the leaves emerge. The flower of the tree is never seen, as its many tiny flowers are housed within the fruit bud. Two crops are produced each year. The first crop is eaten fresh, while the second crop is dried for winter. Mentioned over fifty times in Scripture, the fig tree was extremely important for both nutritional and economic reasons in ancient times. When things were well in Israel and the people prosperous, the Bible describes “every man sitting under his own fig tree” (1 Kgs 4:25). 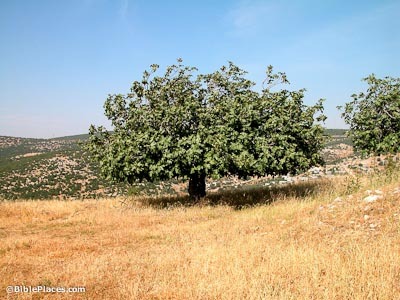 The prophets on the other hand, when predicting judgment on Israel, speak of the fig trees being destroyed (Jer 5:17). 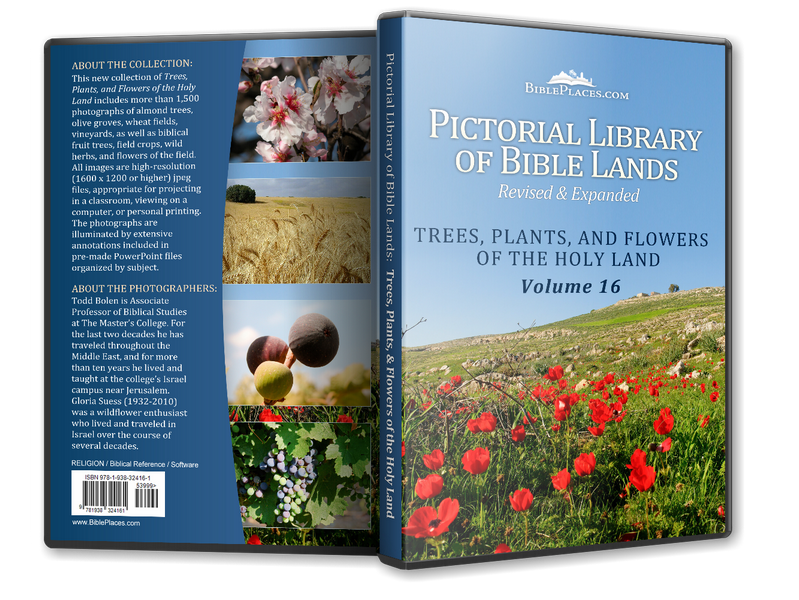 The first mention of a fruit tree by name in Scripture references the leaves of the fig tree, not the fruit. Adam and Eve sewed fig leaves together to hide their nakedness (Gen 3:7). The leaves are as large as a human hand and are hairy on the back side. 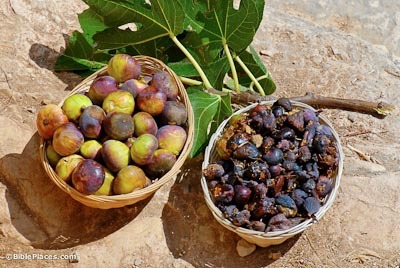 Figs, common in the Middle East today, were cultivated in Canaan before the Israelites entered the land. They were one of the seven species listed among the produce of the land God would give Israel (Deut 8:8). The spies brought back samples of this fruit before Israel entered the land (Num 13:23). 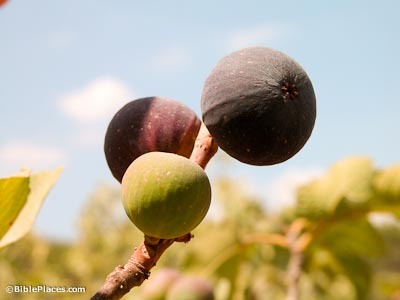 Figs are both cultivated and grow wild in the region. The gospels also frequently mention fig trees. Jesus cursed a fruitless fig tree along the road to Jerusalem. Both Jesus and James used the production of figs as an example that actions and words flow from the heart of a person (Luke 6:42-44; James 3:12). 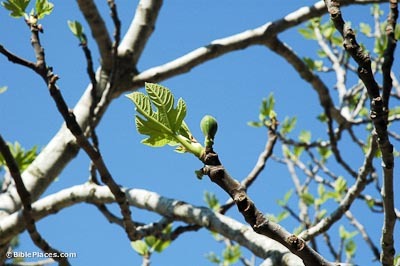 Finally, because the fig tree is the last tree to produce leaves and it does so right before summer, Jesus used it as an example of knowing that the end of the age was near when the signs came (Matt 24:32; Mark 13:28). “After Jehoiachin son of Jehoiakim king of Judah and the officials, the craftsmen and the artisans of Judah were carried into exile from Jerusalem to Babylon by Nebuchadnezzar king of Babylon, the Lord showed me two baskets of figs placed in front of the temple of the Lord. One basket had very good figs, like those that ripen early; the other basket had very poor figs, so bad they could not be eaten” (Jer 24:1–2, NIV).